Is the latter really better than the former? Now, at last, after several years of high definition broadcasting, things are hotting up with actual display devices that will deliver the full promised resolution. So now that we can actually see high definition, rather than merely receive it, is it actually worth the trouble? True high definition displays have a physical resolution of 1,920 by 1,080 pixels. I should point out that, as I write, there is no such thing as 1,920 by 1,080 pixel HD TV transmission in Australia*. Two stations broadcast at the 1080i signal standard (Nine and Ten and their regional affiliates), but the actual broadcast resolution is 1,440 by 1080 pixels. ABC uses 1,280 by 720 pixels in progressive scan format, while Seven and SBS use what is HD by law only, 720 by 576 pixels in progressive scan. So is HD actually any better than standard definition television? Or is it all just hype? Well, my impression from just sitting there, watching HDTV, is that there is an improvement much of the time. Sometimes it has been a huge improvement, with detail apparent in HD that simply isn't there with SD. With other programs there seems to be little difference. How to demonstrate these for you? What I have done is capture identical frames from the SD and HD versions of broadcasts of several shows and placed them side by side for you to inspect. I recorded the incoming MPEG2 video streams on digital TV receivers. For HD, I used the Strong SRT-5490 high definition PVR, and for SD I used the Topfield TF6000PVRt. Both of these PVRs can be incorporated in a computer network, so I was able to download their recordings to a computer, and then capture still images from the MPEG files. Since the MPEG2 stream these PVRs record is identical to the MPEG2 stream that the stations transmit, these pictures perfectly represent the differences. 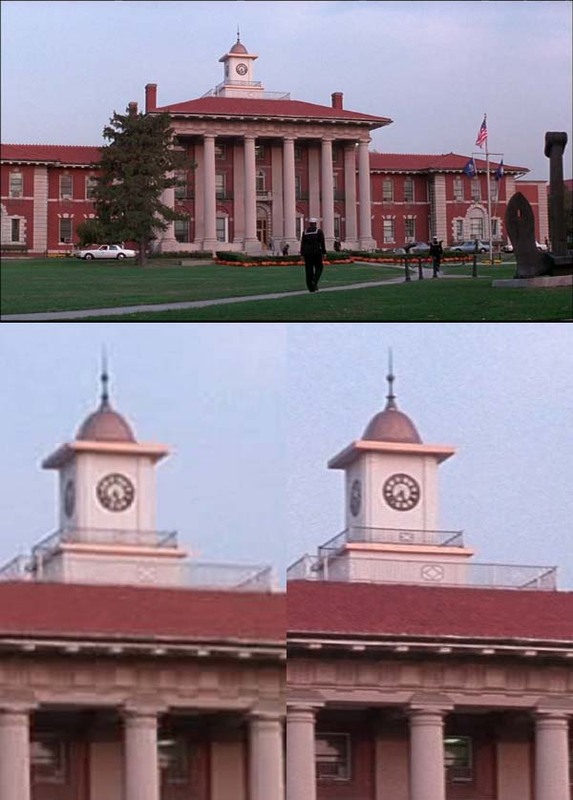 The original video captures were not retouched in any way at all, except as follows. First, I scaled up the SD version in Photoshop from its original 1,024 by 576 pixel resolution to 1,920 by 1,080 so that it matched the HD version in size. Then I cropped out the same feature from the matching frame in each version, so that the comparison shots could be placed side by side. Does the scaling of the SD picture damage it? Not really. Good scaling from 576 to 1080 lines degrades the picture very little. And remember, if you have a 1080p display, that is precisely what the display will be doing to your pictures. So let us proceed with comparing standard definition and high definition sources, and see if there really is a difference. I confined myself to the versions of Channels 9 and 10 available in my area for this comparison, because in my area they both have the advantage of delivering 1080i signal quality in their HD versions, and only broadcast natively HD shows on their HD channel. When those shows aren't on, and even during the ad breaks, they broadcast a HD loop of scenery. So I could be certain that what purported to be HD truly was (some stations merely upconvert all manner of low resolution material to a HD output, but of course detail isn't improved). The first comparison was from the broadcast of Harry Potter and the Prisoner of Azkaban on WIN TV (Channel 9). The differences between the SD (left) and the HD (right) versions of this broadcast were, frankly, disappointing. It seems to me that the whole picture was shot with a degree of softness anyway, with an emphasis on mood rather than clarity. The data table discloses that the SD version uses a quite high average video bit rate, indeed rather higher than the average DVD, whereas the HD version uses a rather low average video bit rate. But there were differences. Oh yes indeed. 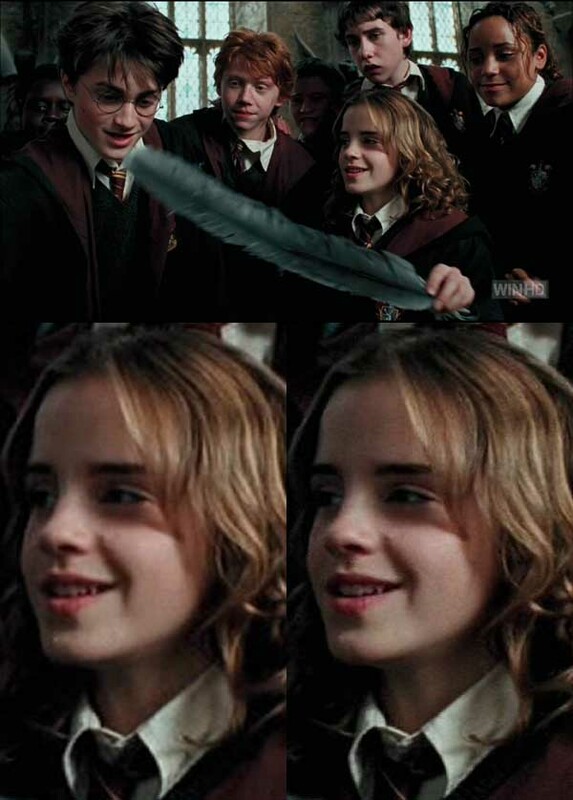 Examine the two shots of Hermione's face. At first glance there is nothing to tell them apart. Now, look more closely. Her cheek on the HD shot has texture that is quite absent in the SD shot. The, um, small protuberance next to her upper nose is distinct in HD, but ambiguous in SD. The loose strands of hair in the lock over her collar can be seen in HD, but are missing in SD. Finally, and most importantly, in SD the whole picture is just a little softer in focus than in HD. This makes for a less relaxing viewing experience on the big screen, because the eye is struggling, unsuccessfully, to bring the image into sharper focus. Does Superman junior appear with a super difference in HD? 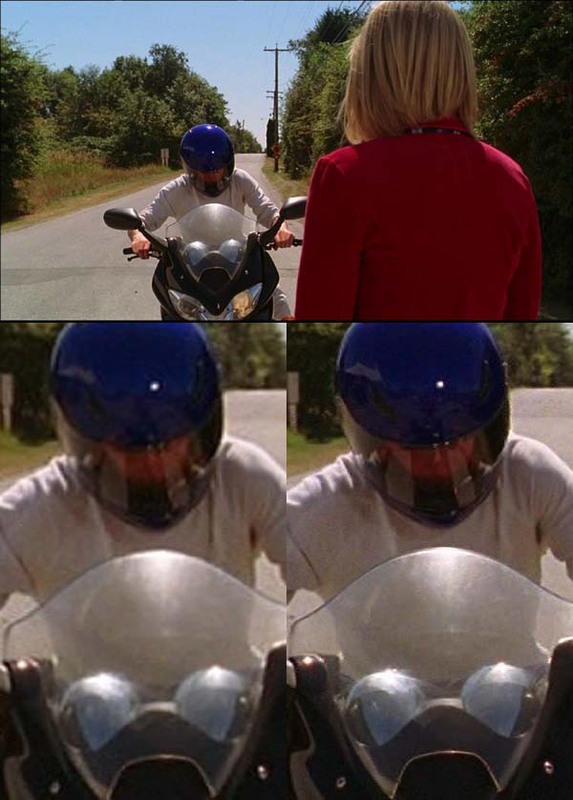 'Smallville' (Southern Cross Ten) benefited from a bitrate of more than double the SD version, and sharp, well-lit photography, so the differences were kind of obvious. You can inspect it yourself. See the hard edges on the motor wind shield. Well, they are hard on the HD version anyway, if soft and fuzzy on SD, despite the SD being transmitted with a bitrate around the same, or a little higher, as the average high quality DVD. Also look at the highlights on the two chromed instrument canopies. The detail on the HD version is marvellous, whereas by comparison the SD versions are fuzzy splodges. This movie was on Southern Cross Ten, a Channel 10 affiliate, so like 'Smallville' it benefited from a significantly increased bit rate. It also had boring old stereo sound rather than 5.1 surround. Oh well. But in the picture, you certainly see the difference. Obviously the SD version is much fuzzier. Look at the top railing. The pattern in the middle is all but invisible in SD, but quite clearly defined in HD. Look at the relief ring near the top of the centre column. It looks quite three dimensional in HD, while it isn't even clear what it is in SD. The background sky in HD is speckled, while that in SD isn't. I think this is film grain. And look at the edges of the dome and its spire. Do you see the splotches in the sky close to the hard edges in SD? Those are MPEG artefacts, absent from the HD version. This Australian produced drama was one of the first in high definition, and is one of the few TV shows with full Dolby Digital 5.1 channel sound. Unfortunately, in this part of Australia at least, the sound flicks back from 448kbps Dolby Digital 5.1 to 448kbps Dolby Digital 2.0 whenever an advertisement comes on. With the high definition digital TV receiver I was using, this produced a loud click on the switchover, and the 2.0 periods were very noisy, and much, much louder. But back to the picture. Clearly the HD is sharper and more detailed than SD. 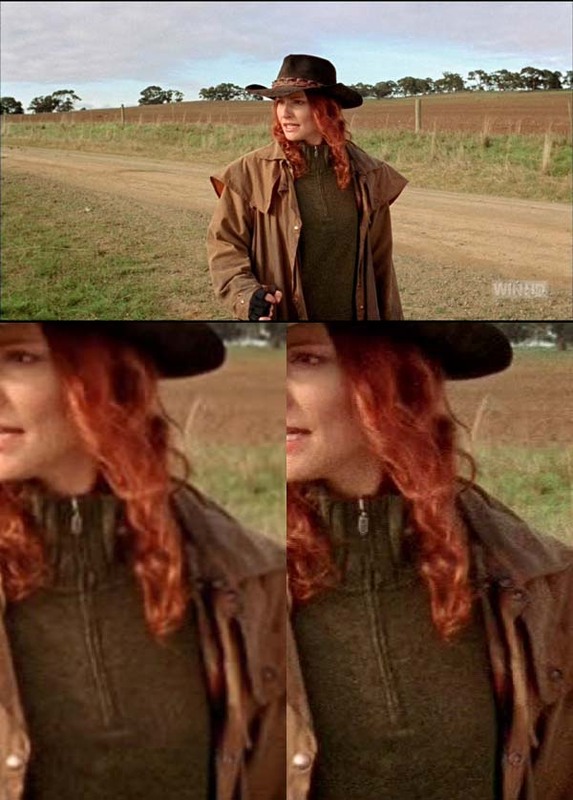 Note in particular the texture on the woman's jumper, which is pretty well missing in SD. Now here is something strange. The grass beyond her shoulder looks fuzzy in the SD version, as though there were depth of field limitations in the camera work. That would be odd in a brightly lit outdoors scene. But in the HD version it snaps into focus, making it clear that SD was giving a misleading impression of the camera work. In preparing this article, I used JPEG compression to make the shots manageable for email. With the detailed shots, I used the highest quality setting to avoid damaging the images. The SD version of this picture consumed 82kB, while the HD version took up 109kB. The reason for the difference is the far greater detail in the HD version (in the original pieces sent to the magazine -- the pictures here are more heavily compressed). Okay, I agree that this isn't really what we want HD for: inane talk and the unrelentingly enthusiastic promotion of products. But for our purposes, it illustrates an important point. All of the examples thus far have been progressive scan programs. I don't mean that they have been broadcast in progressive scan, because they haven't. The SD programs are broadcast in 576i, and the HD ones in 1080i. But the material was originally captured on film, so each two fields that are broadcast can be woven together to create a single coherent frame. But poor old Kath and, er, I mean David and Kim, are captured on 1080i studio video cameras. So instead of the two fields that constitute a frame coinciding in time, they are captured a fiftieth of a second apart from each other. So if one shifts a head to one side, any one frame will show trailing lines for where their head was formerly, and leading lines showing where it is in the current field. The net result we call 'combing', for the short horizontal lines resemble the teeth of a comb. It is the job of one's display to endeavour to pull these teeth and, inevitably, picture quality suffers as a result. But as you can see from the comparison shots, in HD combing is far less objectionable than it is in SD. Every single one of these examples revealed an improvement in HDTV over SDTV, ranging from subtle to quite obvious. On a large screen in particular, especially a projector, HDTV viewing is a far more satisfying experience, not so much because of the additional detail it permits, but because the projected image is sharper, and therefore easier on the eyes. The transition to HD has been slow and stumbling, but with true high definition displays now available at reasonable prices, the move may well accelerate. This will likely be enhanced by the introduction of Blu-ray and HD-DVD, which of course also offer high definition video. But is Blu-ray any better than DVD? In the next issue we compare these as well. * I am informed that some stations outside of Canberra do, in fact, use the full 1,920 by 1,080 pixels of resolution.